Join us for an evening of modern Americana, Folk & Blues with Davin McCoy and Jon Shain! Special guest Bill Sheffield kicks things off at 8pm. As an 8 year old, Davin McCoy would whistle “Sittin on the Dock of the Bay” in his sleep. The well of creative passion was beginning to seep. Born in Albany, Georgia and raised in separate households, Davin’s inherit gift and calling for music would finally manifest at age 12, when he found the guitar. Shortly thereafter, Davin began writing his own songs—musical emotion and expression akin to Cat Stevens, Van Morrison and of course, Otis Redding. After a short stint at the University of Hawaii, Davin succumbed to his calling and began his life-long dedication to writing and performing; to observing and inspiring. At 21, Davin teamed up with Clay Cook (John Mayer, Shawn Mullins, Zack Brown, Marshall Tucker) to record his first full length musical effort 40 Days From Friday. Unyielding to fear and eager for experience, Davin quickly shipped off to London where he would take up a publishing deal and continue to write and perform. As the intensity and efficacy of his writing grew, the urge to live and feel and the apparent need to travel and encounter became clearer. Davin’s music would take him over oceans and across continents, from London to L.A., and to Florida via New York. Perhaps in the realization of his roots, Davin returned to Georgia, where parallel destinies converged and a long overdue meeting took place with music legend Davis Causey (Sea Level, Allman Bros.). Recording sessions with Causey led to the creation of So Good, So Cruel, Davin’s second album and his most inspired work. Inspiring indeed, as Causey would need to hail the talents of masters and former Sea Level band mates Randall Bramblett and Chuck Leavell (Allman Bros, Rolling Stones, Sea Level) to play on the record along with a borrowed Widespread Panic horn section. Together with Casey Crogan on the drums, Davin and company made magic in the studio. Calling on every influence available, there was never an attempt to hide where the bodies in this collection of sure to be classic, timeless songs were buried. 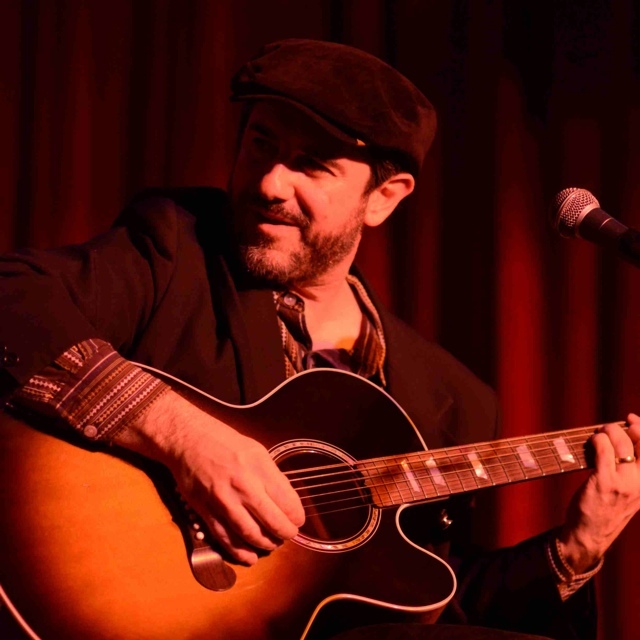 Jon Shain is a veteran singer-songwriter who's been turning heads for years with his words, his fiery acoustic guitar work, and his evolved musical style - combining improvised piedmont blues with bluegrass, swing, and ragtime. Shain’s newest disc, a rollicking live album called The Kress Sessions, was recorded this past spring with his group in Durham, NC. After his band's breakup, Shain went solo, returning to his roots in the folk and blues circuit. He has released six studio albums, working with studio luminaries such as Dave Mattacks, Tom Dube, and Chris Stamey, along the way. In addition to festival slots and headlining club dates, the last few years has seen Shain playing esteemed listening rooms such as The Living Room and Caffe Lena and opening sold out theatre shows for John Hiatt, Keb’ Mo’, Little Feat, and others. When Shain is not recording or performing, he stays busy giving private instruction in Piedmont blues fingerstyle guitar, and teaching group workshops in songwriting and blues guitar. Everything about Bill Sheffield is authentic. It's there in the intense, transcendent way he finger picks his guitar with hints of John Hurt and Blind Blake flashing through. It's there in his songs that wrestle with earthly pleasure and the need for redemption. And it most definitely is there in Got A Gig, Gotta Go, his 9th studio recording on American Roots Records. Journal On A Shelf, Sheffield's release and the new Got A Gig, Gotta Go distill a lifetime pursuit of authentic American roots music that announce the arrival of one of the most significant roots musicians to emerge in the past decade.